Hello, world! I made another iPad painting!!! 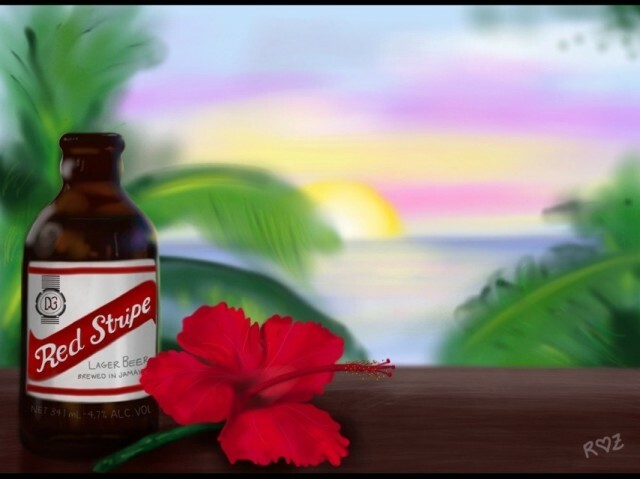 This time, I was inspired to create something that captures the essence of Jamaica, so I chose to do a beach setting with a Red Stripe beer and hibiscus flower in the forefront. Like the last iPad painting I did, I really didn’t know how it would turn out in the end but I did gain more confidence as I continued. I found a picture of the beer bottle online, and I love hibiscuses so much that I didn’t have to use much reference to create the flower from memory. The background was the easiest part, and I found myself using the Nomad brush for all of it but I used the Bamboo stylus for the foreground. Making the bottle was a lot of fun, especially since I got to capture the reflection of the setting sun’s colors on the sides of the bottle. The funnest part was definitely painting the flower though. I like the way the pistil and stamens came out too. This is quickly becoming one of my favorite pastimes. :) I can’t wait to do another oneeee!!! Any suggestions for what I should make next? Let me know! I need ideas!